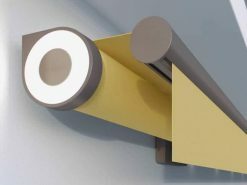 With surveyors and installers based in and around Surrey, Roché offer the expertise and experience of a national business with the convenience and personal service of a local one. We have over 15 years’ experience in providing Markilux and Weinor sun awnings for the domestic and commercial markets in and around Surrey. We understand that property values here are higher than anywhere else in the UK outside of London. Maximising any available space is particularly important, and one way of doing this is to turn an unused garden into a vibrant living space. 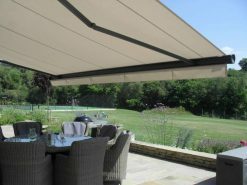 Whether your property is based in an urban hub such as Woking, Guildford and Walton-on-Thames, or a traditional village like Oxshott, Ripley and Bramley, a retractable awning can become a real feature for your outside space. Speak to one of our awning experts to find out more. Surrey is one of the most populated areas in the South East, and high property prices mean that space is at a premium. An effective way to increase living and entertaining space is with a patio awning. 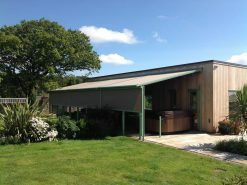 Retractable awnings such as these are suitable for gardens and balconies on both domestic and commercial properties. Roché offer the full range of Markilux and Weinor awnings, all of which are made to order to the highest quality standards. To find out more about our Surrey patio awning survey and installation service, speak to a member of the Roché team. Veranda awnings have front support posts for extra stability. 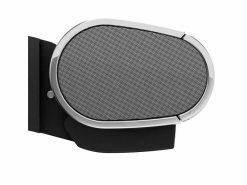 This makes them suitable for covering large areas, open spaces exposed to strong winds, or heavy duty commercial usage. 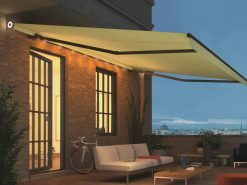 As with the patio awnings above, all designs have been wind rated, with technically advanced waterproof and UV-resistant fabrics. Many Surrey-based homes and businesses already benefit from Markilux and Weinor veranda awnings. Contact us for more information. 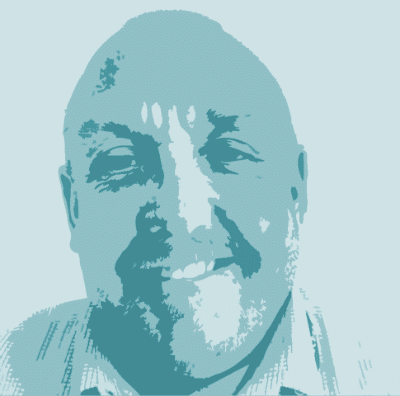 Frank is our main surveyor for Surrey. He visits both domestic and commercial properties and will assess your requirements, measure up and answer any questions you have regarding our awnings. He has surveyed many properties across Surrey, covering the cities of Guildford, Woking, Ewell and Camberley, amongst other areas. 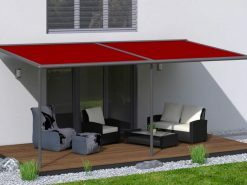 If you are interested in finding out more about our Surrey awnings, speak to the Roché team. They will arrange a date and time for Frank to visit when it is convenient with you.